Make waffle batter (all above ingredients minus the fruit/butter and syrup) in blender or in mixing bowl with hand mixer. Place on greased waffle iron. Cook until steam stops escaping from the waffle iron. 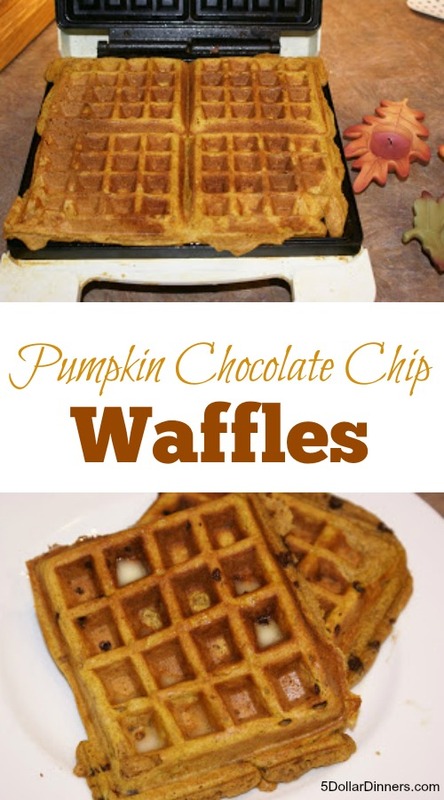 Serve Pumpkin Chocolate Chip Waffles with Fruit. I love this recipe. I love pumpkin. I love dark chocolate. I love waffles. What’s not to love? I feel this may even be better than my Oat Bran Chocolate Chip Pancakes with the pricey real maple syrup. Wish I had a waffle maker. I’m a single guy with no idea on saving money. While looking for budget web sites, I came by your site by chance and love it. I enjoy the posts and what everyone has to contribute. I wanted to thank you !!!! Hi Erin, these look yummy! Can you tell me how many waffles it makes? Also, do you think it would turn out okay if I cut the brown sugar in half or left it out altogether? I’m not sure what sugar does for recipes other than sweeten it? Thanks! I doubled that batch…made 6 waffles pans worth. The sugar is just for sweetening…I imagine you could replace it with agave or honey, but I haven’t tried that yet! Let me know if you do and how it turns out! This recipe sounds great, and it’s nudging me to finally go out and buy wheat flour for the first time. I’m going to also use Splenda Brown Sugar Blend for the first time, I bought it over a month ago but haven’t baked anything yet. Let me know how it turns out with the splenda. I’ve never baked with it, but am curious how/if its different from sugar when baking! Very interesting combo but I like it. Going to have to try these. Love your site! Really nice recipes. I have always been curious, how do you reheat your waffles after freezing? My kids have to be to school really early and we have a long drive to get there. They love waffles, so I would love to be able to make them some healthy ones like these, but need to reheat rather than make fresh in the morning. I usually pop them into the toaster still frozen. If they don’t warm up enough or get crispy enough, then I’ll put them in again for maybe half a toaster cycle…don’t want to burn them! I know what I’m preparing for Sunday morning breakfast…this look fantastic!! And I always freeze the extras too…like you, I just pop them in the toaster in the morning and usually spread peanut butter on them. What size is the can of pureed pumpkin? I can get them in 2 sizes. I am really excited to try this recipe out. These were good. However I feel there was to much chocolate for my taste but my boys devoured them in seconds which says a lot from those picky eaters.